Paper handicrafts are a simple way of developing creative abilities! Times change, but crafts made of paper and cardboardRemain relevant even now. The creation of simple paper garlands and snowflakes in the school years was the beginning of the creative path of many artists. But recently, crafts from paper their ownHands have acquired a new semantic color, as the technique of their manufacture has reached a completely new, complex level. Many items are highly valued by collectors, and their cost is quite large. To claim for world recognition is, of course, early, but you can still learn how to create some paper products. This paper at the beginning of its existence in theDistant 1856 was used by the British to make a lining for hats. It sounds pretty strange for a modern person, does not it? Nevertheless, over time the field of application of "Reapers"Has considerably expanded and today we no longer represent the world of gift packages without its rustling. Based on the size of the corrugation, the cut paper is divided into 2Type: conventional and creped (with a small pattern). The second option is most suitable for the very beginning of the child's creative path: it is soft, pleasant to the touch, has a variety of colors, which has won the love of children. «Harvester"Suitable for creating scenery, garlands and fabulous stage costumes. Variety of corrugated paper craftsGreat, but the most attractive flowers look made of this material. 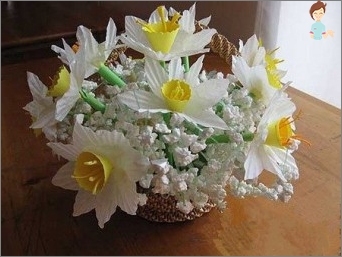 Therefore, it is worth considering the most popular ways, making paper flowers. What a holiday without flowers, and what for March 8 without tulips? In the childhood everyone did these wonderful flowers from paper and gave them to their beloved mothers. Today you will learn how to make a tulip with corrugation. First you need to cut 6 paper stripsWidth of about 3 cm, a length of 18 cm. Then twist the strip in the middle, like the edge of a candy wrapper. Fold it in half. Stretch the resulting layers, forming small petals of the tulip. The base is clamped and tightly screwed. Should get a bud. A strip of green color 2 cm in breadth. The length will be different, it all depends on the frequency of the skeins, so it is desirable to cut, across the corrugation line. Fold the strips in half and glue them with a wire 15 cm long. Place 3 petals around the stem, from abovePut the following 3. All this business strengthen, surrounding a stem with petals smeared with glue a green strip. Long strips of green leaves just screwed to the base. The next way to decorate the paper in a flower will be to sweet tooth. 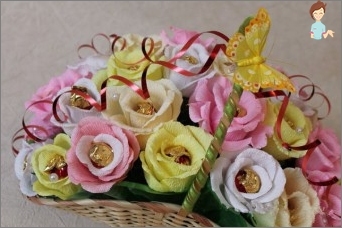 Such a sweet bouquet is made very easily and it can be quickly prepared for the next holiday. Such crafts made of paper can be put in a regular vase, but by placing them in a basket, you can add compositions that are pretty. Favorite candies are attached with scotch tape. Cut out different sized petals for future roses. 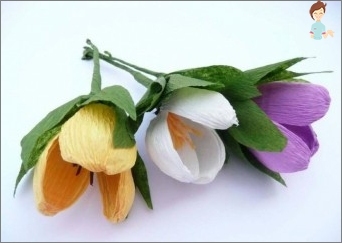 You can make each flower a different color, and you can choose several similar shades. For the bud, cut out a rectangle with a width of at least 10 cm, stretch it in the middle and wrap it with a candy. At the base we fix everything with scotch tape. The petals are attached in exactly the same way. Having bent all the edges of the petals, you will see that you have a rose. The more you wrap the petal, the more noticeable will be the sweet heart. You can leave everything as it is, but you can put the flowers in the basket, sticking them into the foam. Funny articles made of colored paper and cardboard are more often found in children's art. They are easy to make, so the kids, not tired at all, spend their free time with profit. For joint family creativity, you can choose to make small cardboard penguins. We cut rings - 6 pieces and a half, eachWidth of 1 cm. Another cut in half. From it the eyes will turn out. Color the rings in this way: 1 half and 1 ring - orange, 3 - black, 1 - white, 2 remaining strips (future eyes), we paint half black, half white. To create the feet, fold in half and glue together in the middle of the orange ring. From the halves of the same color we master the beak: we make a droplet, fixing the edges with glue. Black and white halves are twisted in a spiral, pre-lubricating them with glue. We form a white body and black wings. We glue all together, pressing fingers. In the last black circle we insert eyes and beak, lubricating them with glue. It turned out the head of the penguin. We connect all the parts. Folding paper figures, called "origami"Is a very fashionable art form. Originating in ancient China, it blossomed in the hands of Japanese masters, and after - captivated the whole world. Origami technique is very versatile: one product can be collected for 5 minutes, and the manufacture of the other will be delayed for several weeks. Interestingly, this art has its own universal system of signs, so that the folding of any model can be represented using a series of drawings. Origami wet folding (wet paper is used). Paper - a unique material that allows you to give vent to creativity at any age. But what is important is not so much what a person uses for his creativity, how much his openness to learning something new.